You get two horrifying movies from the master of mayhem in one box. That's a great bargain! Both of these films, conceived by Rob Zombie, are very well-made and sure to give you a good scare. The storylines are straightforward and not too fancy, but the gory scenes and wild chases deserve five glittering stars and two shaking thumbs up! 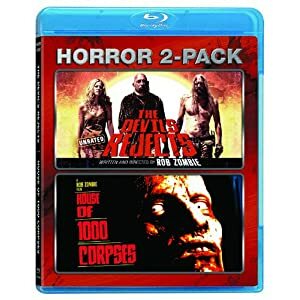 Insane horror and violence courtesy of mentally unstable characters awaits you in The Devil's Rejects and House of 1,000 Corpses. Both movies feature the Firefly family - an extremely ill-mannered people that always leave a bloody mess everywhere they go.